Books | Stroke Educator, Inc.
Stroke and brain injury resulting in aphasia and loss of the ability to read, write, or speak is a devastating disability. This primer provides tools for aphasia therapy and rehabilitation that spur learning for recovery and regaining those lost skills. On September 26, 2011, Tom Broussard, a recent Ph.D. with an emphasis on helping people with disabilities get work, experienced his stroke in the section of the brain called Broca’s area. The stroke rendered him unable to read, write, or speak well. Aphasia, the impairment of language, was the result. He kept a diary using drawings, charts, and graphic representations including using mostly real words that didn’t make much sense. Losing his language meant losing his grammar and syntax. Writing his diary, recording his voice, (Friday, November 11, 2011, Voice Memo, 1:42 PM, 1m, 38s), and studying his brain, he got better and better, until he experienced full awareness at 11 months. In addition to his own voice, he developed another “voice” (or two) that helped him understand the condition of his thinking and how thinking works. Broussard has been speaking at hospitals, clinics, and to a wide audience of people with strokes, to caregivers, students, and medical professionals with an interest in how our brain works and how recovery is accomplished. Tom Broussard is someone who saw his brain from the inside. His account is a valuable resource with an inspiring story that touches everyone connected to strokes and aphasia. 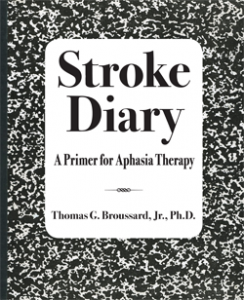 Stroke Diary, A Primer for Aphasia Therapy is the first of a trilogy. This volume provided the daily facts as he knew them for 11 months: the reports from his therapist, his diary, his drawings, his voice recordings, every report from his doctors, every page of his calendar, artifacts from his therapy, emails, photos and much more! Click here to read Chapter One. 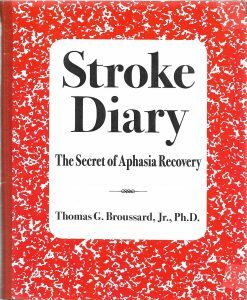 Stroke Diary, The Secret of Aphasia Recovery (Volume 2) was published on September 17, 2016. This volume provided the explanation of how he got better, and why. Aphasia recovery is all about the doing. When you have lost your language, the best thing to do is practice your language, damaged as it is. It is both a curse and a blessing. 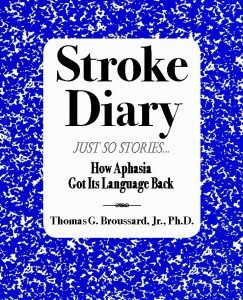 Stroke Dairy, Just So Stories, How Aphasia Got Its Language Back (Volume 3) was published on January 23, 2018. Practice is more than just practice. Practice is the prescription for improvement. People with aphasia must become more aware that practicing is the cure. The brain requires a special kind of “food”—activities and experiences which induce plasticity. These stories were part of the process of engaging the environment to “light up” learning. Stroke Diary is available on Amazon, Kindle and Ingram.